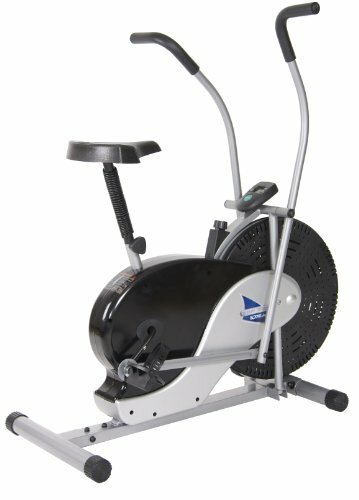 Ideal for total body workouts, elliptical workouts, and upper body training Features adjustable seat heights to accommodate a variety of users Complete with fan wheel that provides a cooling breeze during workouts Tensions adjusts with included knob so you can control intensity of exercise Solid steel construction to withstand years of use Some assembly required Manufacturer’s warranty included: see complete details in the Product Guarantee area About Body Champ Incorporated since 1993, Body Champ has spent over 20 years establishing itself as a leader in the field of health and wellness. Endorsed by the average user and even professional athletes, Body Champ provides relief and support in a world that’s rough on us. Offering fitness equipment from treadmills to exercise bikes and wellness equipment from massage chairs to inversion tables, Body Champ has you covered. Because our health is all we have! Assembled dimensions: 45L x 23.25W x 45.63 H inches. Customizable seat positions. Adjustable tension with turn of a knob. Dual-action handlebars create an efficient upper body workout. 250-pound weight capacity. Manufacturer’s warranty included (see product guarantee).